When you think of the Netherlands, one of the first things that comes to mind, is their love of bicycles and cycling. 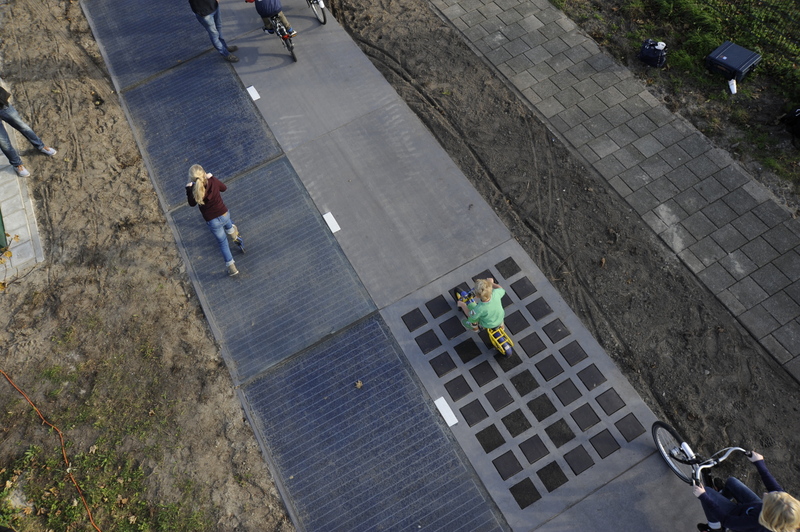 Considering this, perhaps it is no surprise, that the Netherlands was the first country in the world to design and install a road surface used by cyclists that absorbs sunlight and coverts it into electricity. Known as SolaRoad it is a three-year pilot project that was opened on 21 October 2014. Described “as the road of the future and the road to the future” it is intended to one day show how roads all over the world could potentially supply power to homes, other buildings, street lighting and traffic lights using the sun and solar energy. It was developed by a “golden triangle” consortium consisting of business and industry representatives, research institutions and the government. It measures around 70 metres (230 feet) in total and cost $3.7 million to build. The concept of SolaRoad is simple. Solar cells located permanently on the road’s surface capture sunlight and convert it into electricity. As such the road acts as one large solar panel. Developed in prefabricated slabs SolaRoad faced challenges not common to the installation of solar panels on top of a house or building. Because the road is used by cyclists the SolaRoad had to be strong enough to withstand the weight of bicycles regularly going over the top of them along with the weight of the people on board the bikes. To ensure this a translucent top layer of glass, approximately 1 cm thick, was installed over the top of the 2.5 by 3.5 solar cell modules. This layer had to be translucent enough to constantly attract sunlight while simultaneously repelling as much dirt as possible. Scott Huntington, writing for TriplePundit, believes that “the path exceeded expectations even its early stages.” In excess of 150,000 bicycle riders have used the path which has helped generate in excess of 3,000 kilowatt-hours of energy which is enough to power an average sized home for one year. This suggests that it is clear that Dutch cyclists have adapted to the path well, have hardly noticed anything different about the road’s surface, feel that it is safe to use and are subsequently prepared to use it. Because it is a pilot project, it was expected that testing and improvements would be an ongoing process, and this has proved to be the case. Shortly after opening a section of the road had to be closed for repairs as poor weather conditions caused a part of the path’s top layer to break off despite being subject to rigorous laboratory research and testing prior to installation. While it is possible that other unexpected challenges may arise, scientists, researchers and businesses will learn from these, and will be expected to make technology improvements. Some critics have pointed to the high cost of renewable energy generated in related to the overall cost of the project. At a cost of $2 per kilowatt the money used to fund SolaRoad could have instead been used purchase 520,000 kilowatts of electricity which is enough to power 173 average houses. However, if ambitious pilot projects, such as these are not developed and installed, technology improvements will be harder to achieve. Ultimately, one country or consortium, will have to be brave enough to lead by example so that others can learn and make improvements. The decreasing global cost of solar photovoltaic panels and solar energy should also make initiatives like this cheaper in the future. France, has subsequently followed the Netherland’s example, and open a solar power road of its own, which can be used by cars. Located in the town of Tourouvre and measuring a kilometre long, it is more than ten times the length of the SolaRoad in the Netherlands, contains 2,800 square metres of photovoltaic solar cells and cost $5.2 million to construct. Also considered a pilot project, the road forms a small part of the French Ecology Minister, Ségolène Royal, plans to see solar roadways ultimately replace one kilometre of every thousand across France.